WashGuys Food Drive is becoming a huge success. Although it got off to a slow start perseverance has paid off as Lori Martin refused to give up. Each day after work she collects barrels filled with food and inventories them. 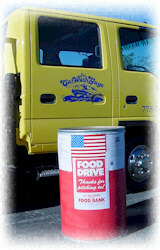 The next day between accounts she drives the food over to the Food Bank, which is indebted to Lori's Hard Work. 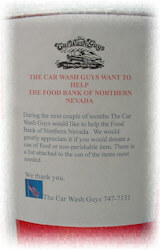 Wash Guys always come through whether it is a community car wash fundraiser or a special event. It is so difficult to run a small business in the middle of a recession and still help your community. Lori and her daughter Breanna are pledged to do what ever it takes. Northern Nevada Food Bank predicts this maybe one of the best years ever. And if Lori has anything to say about it, it is time to blow away the last years record. Lori not only is a great at collecting food for less fortunate American Team Members, but also is more than excellent at preparing it. She has been contemplating a Rib's Cook Off, we have sampled these ribs at the HQ and have to admit they are as good or better than the very best ribs restaurants in Memphis, TN which is known worldwide for it's ribs. 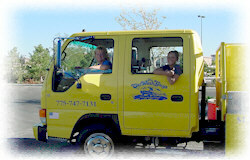 Lori, often uses the companies large double cab Isuzu work truck to collect the barrels of food, due to the size and weight. She has barrels in Banks, customers locations and even Safeway Stores. It is hard to find such a dedicated and caring person like Lori, who left Corporate America, to find something that would be more fulfilling. She has found that with the WashGuys. This year Lori and her team have done three car wash fundraisers and have three more planned on top of all this work collecting food for the food drive. God Bless America and God Bless the people that day in and day out make this country so great. Thank you Lori for showing us that the Spirit of America is still alive in the greatest nation on Earth.